You folks who also have Garmin Zumo GPS’ know exactly what this is. It’s the little screwdriver tool that you use to “unlock” the GPS from its cradle. 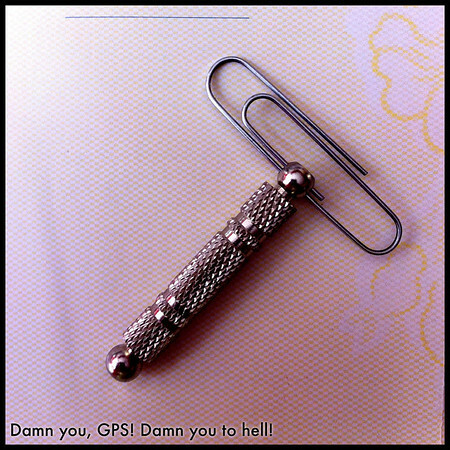 It is also one more facet of the GPS experience that drives me bananas. Not because it does or doesn’t do anything on its own. It’s more… because I’m a moron. I have this annoying little habit of losing things like my glasses and my wallet. This little Zumo tool doesn’t stand a chance against the power of my distracted-ness. I misplace it routinely. In an effort to not lose things, I often come up with “tricks” and “plans” to remember where they are. I can probably tell you what town a Muffler Man in Illinois is in off the top of my head, but heaven help me I can’t remember those places I put things so I would remember where I put them. Undoubtedly I will give that pocket a precursory squish, pat or poke and not feel it right away and assume all hope is lost. Again. But, rest assured it IS in there. I understand that they make things little so that they’ll fit into pockets easier and be lighter, but when they are too small they are inconvenient. Because they are so hard to find. Good idea on the paper clip. Hopefully that will make it easier to locate. Maybe you need to put it on a clapper keychain so it makes a noise when you clap, lol. Kidding. Ha! That actually made me LOL for realz. I tried to resist the impulse to “fix things that don’t need fixin'” but failed. How about on the same keyring as your spare keys? Make my own out of small screw drivers now! I have a dozen of those damned things and have still had the same concerns. FWIW, the new Zumo doesn’t use one of them. On my new Beener, the factory cradle locks it in place. On my Triumph, I suppose I have to stash it in my pocket every time I stop to pee and buy some peanuts. I am not sure that’s progress…. I’ve lost the screw on cover to the damn thing. Another thing. What’s with the tiny hole that isn’t big enough to work on a key ring? It messes up the free movement of my keys. I keep mine on the ring with my bike key. The security screw backed out of my cradle long ago on the Ducati…the tool is useless to me now.